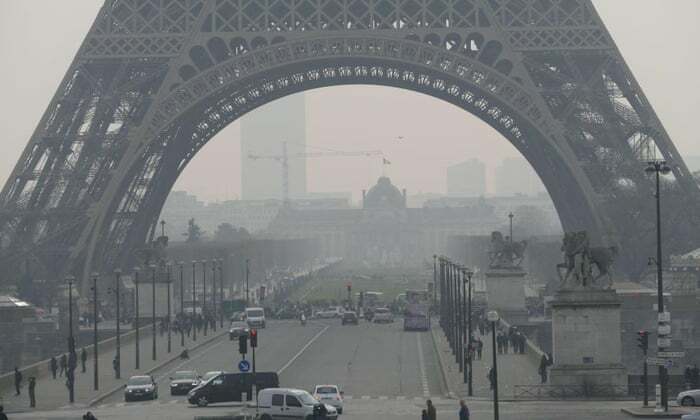 Almost exactly a year ago, I blogged about how the air quality in Paris was at an all-time low, so bad that the city had to ban car traffic in some parts of Paris. According to the World Health Organization and the US Environmental Protection Agency, pollution levels are recorded by “particulate matter” (or PM) levels in the air. So, a couple days later, they did. After enacting a speed limit on Wednesday, city officials banned car transportation with a license plate system on Saturday the 21st, only permitting odd-numbered plates to drive into the city, reports USA Today. European cities are no strangers to transportation bans because of low air quality and high pollution. Milan bans cars “whenever pollution exceeds the statutory limit for 12 consecutive days.” This first happened in 2011. Madrid has also called for citizens to use public transportation on days of high pollution, but it hasn’t worked as well. Beijing remains one of the most polluted cities in the world (though 13 of the top 20 are in India), and to combat this, only half the cars in the Chinese city were allowed on the roads last year, along with the closure of polluting factories. So the question is – would that ruling ever go into effect in America? Could the American government convince us to drive slower or not drive to work because of high pollution levels? Los Angeles, the American city with the most smog, has violated “federal health standards for ozone an average of 122 days a year,” officials told the Los Angeles Times. Luckily, we haven’t had this problem yet, but time will tell.